The Marine Corps selected BAE Systems and SAIC to move into the engineering and manufacturing development phase of the Amphibious Combat Vehicle Phase 1 Increment 1 (ACV 1.1) program, the service announced Tuesday. The two companies were selected from five competitors, and each was awarded a contract to build 13 vehicles now, with an option to build three additional vehicles each at a later date. BAE Systems’ contract is for $103.8 million, while SAIC’s is for $121.5 million. Vehicle delivery is scheduled to begin in the fall of 2016, with testing starting around January 2017 and lasting about a year. 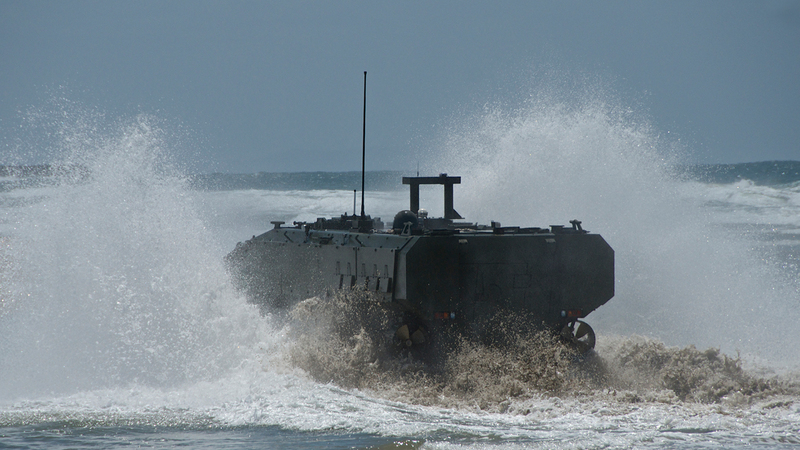 Program Manager for Advanced Amphibious Assault John Garner said that the swim capability of the vehicles in particular has improved over the last year in large part due to internal research and development investment by the ACV 1.1 competitors. “The net result is, we made a selection of very capable vehicles at what we consider to be an affordable price for the Marine Corps,” he said. 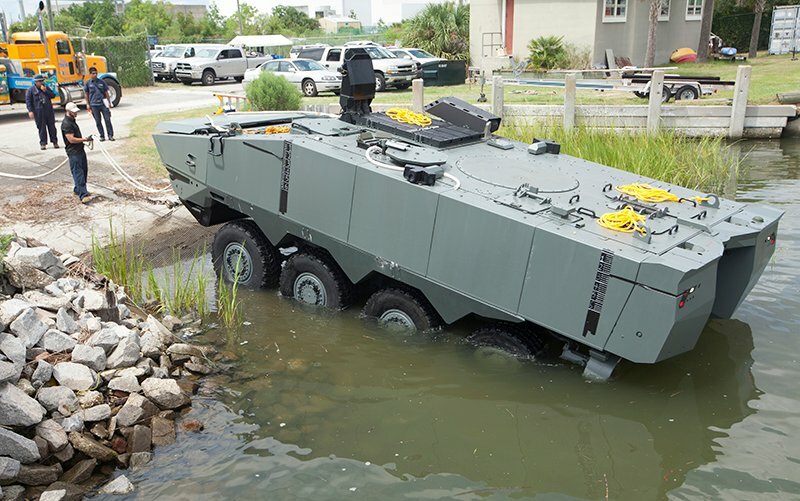 TERREX 2, SAIC’s ACV 1.1 vehicle, completes swim test in Charleston, South Carolina. Photo courtesy SAIC. Garner explained that the Marine Corps valued swim operations, land operations, carrying capability and force protection equally in the selection process. However, he said there were emphasis areas – which essentially award “extra credit” in the event that two competitors meet stated requirements equally – and the emphasis areas focused primarily on amphibious swim capability. Many wheeled vehicles perform well on various ground terrains, he said, and the final ACV selection will be as capable as any other ground vehicle, but “fundamentally this vehicle has to be an amphibious vehicle,” he said. The ACV 1.1 is not required to self-deploy from the well deck of an amphibious ship to the shore, since the Marine Corps decided to wait and introduce that requirement into ACV 1.2, which will also feature mission-based variants of the vehicle. However, Taylor said he is confident that BAE Systems and SAIC will be able to self-deploy, eliminating their reliance on the Landing Craft Air Cushion (LCAC) and Landing Craft Utility (LCU) fleets. Having an ACV 1.1 that can self-deploy also makes the ACV 1.2 effort that much easier and less risky, as the physical ability to drop into the water from the ship without flipping over and then pull itself back into the ship’s well deck is a real challenge, Taylor and Garner said. Part of the success of the program has been the streamlined transition from MPC to ACV 1.1 and eventually into 1.2, the officials said. The Marines built a tech demonstrator for MPC when they weren’t happy with industry’s original technology level, Garner said. The test demonstrator informed the initial requirements for MPC, MPC testing informed the ACV 1.1 requirements, and the ACV 1.1 testing in 2017 will inform the ACV 1.2 requirements. Taylor said a draft of the ACV 1.2 capability development document will be ready by the time ACV 1.1 testing begins, and the draft CDD will be updated as testing goes on and lessons are learned about the state of technology. In addition to the flow of one test event informing the requirements of the next program, the Marine Corps and Defense Department have taken several steps to shorten the acquisition program to save time and money. For example, defense acquisition chief Frank Kendall counted the Marine Corps’ work on the MPC program as meeting the competitive prototyping requirements for ACV, which allowed the ACV program to start at Milestone B instead of Milestone A, Taylor said. This is one of several examples of “knocking down acquisition barriers that will have the net effect of removing years of unnecessary schedule and program cost,” he said. Additional timesavers, Garner said, include the parallel efforts that will take place during the program’s test schedule. The Marines will buy 13 test vehicles from each company now and three later – the current continuing resolution the government is operating under caps the program’s funding, and the remaining vehicles will be purchased when the Marine Corps is allowed to spend more money on the ACV program. Buying 16 of each variant “allows us to shorten the test period by doing a lot of the testing in parallel by having extra vehicles. If for whatever reason we have a catastrophic failure of a vehicle, we don’t lose time to repair that vehicle, we can throw another one in the test,” Garner said. After the 2018 downselect, initial operational capability should be declared in 2020. All 204 ACV 1.1 vehicles will be delivered and in the operating force by the summer of 2023, according to a Marine Corps statement.